When space is tight, YesterTec offers a sleek solution. (Catasauqua, PA) This small New York City apartment is hiding something. 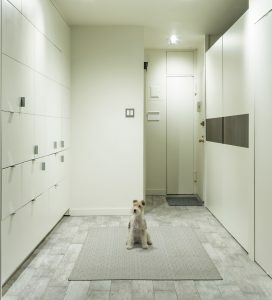 Notice Bebe, an adorable Wire Fox Terrier waiting patiently in the kitchen for her dinner. But wait a minute. Where’s the kitchen? 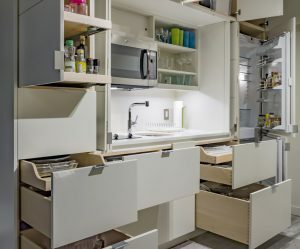 This space-challenged apartment is making smart use of its limited square footage with YesterTec’s Illusive Stealth Kitchen Modules. These customizable cabinets utilize every nook and cranny while being hidden neatly away when not in use, making it easy to keep messes out of sight and conceal key elements of the kitchen for a sleek, uncluttered look that allows the eye to concentrate on other things. Like cute little Bebe. YesterTec understands that having a tiny home or compact living space doesn’t mean consumers should have to sacrifice style or functionality. Stealth Kitchen Modules allow clients to focus on what’s important to them. The cabinets blend seamlessly into any décor and help to create a clean, minimalist look that is soothing and serene. Kitchen clutter is artfully concealed yet the facilities are easily accessed when needed. 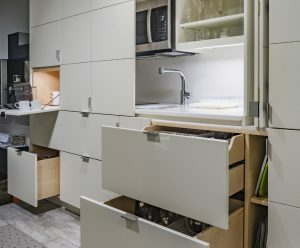 With cabinets starting at an impressive 29” deep, Stealth Kitchen Modules give clients the option to expand storage capabilities without consuming valuable frontage. The range module features a 30” oven and cooktop as well as a microwave or optional second oven. 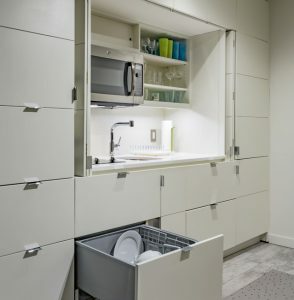 The sink module includes a full-sized dishwasher and large sink, while the refrigerator/ freezer modules can accommodate integrated refrigerators from several manufacturers. There are also storage and working pantry modules with abundant shelving, drawers and countertops. The concealing door and drawer panels can be painted or stained wood, or plastic laminate. One of the most notable features of YesterTec’s Stealth Kitchen is their unique safety technology. Their U.L. Listed pocketing door system allows the ‘hot’ appliances to be operational only when the module’s doors are open and stored securely in their pockets. This smart precaution eliminates the potential fire hazard of a hot appliance behind closed doors. YesterTec is proud to be on the cutting edge of this technology – their development of this system was an industry first. Each unit is beautifully finished inside and out and can be customized to meet the requirements of even the smallest setting. 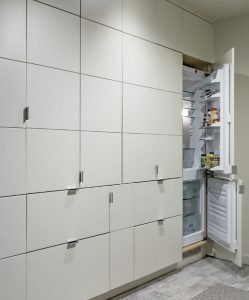 For more information about Stealth Kitchen Modules, visit yestertec.com. Next ArticleLinda Jennings Writes: Concealed Appliances Offer the Ultimate in Design Flexibility and Value.